A dramatic golf destination will soon grace the North Coast of Scotland. 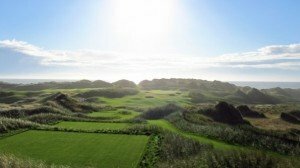 Trump International Golf Links will rest upon 1,400 acres of sand dunes and rolling bluffs, and is set to become one of the finest golf destinations in Europe. Two championship golf courses will be backed by a state-of-the-art golf academy and a distinctive five-star hotel. The property also offers three miles of sparkling, white sand beaches. During 2012 tee times are made available during limited dates only from July 15th to October 31st. There is tremendous interest already and the aim with 2012 is to give the public a unique chance to try the fabulous Links at a very preferential introductory Green Fee rate as the rate is set to rise for the following season.